December 28, 2018, 6:00 p.m. The University of Alabama and Clemson University could once again meet in the NCAA Division I championship game, as they have two of the last three times the game has been played. In this year’s Economist/YouGov Poll, college football fans believe the Crimson Tide will repeat as Champions, though they are not necessarily most fans&apos; favorite team. The more attention people are paying to college football, the more sure they are that Alabama will win. 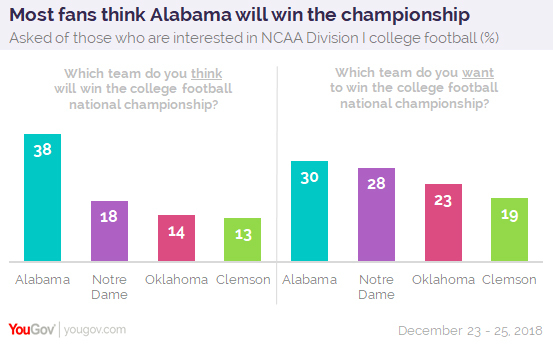 45% of those who are at least somewhat interested in college football, and 51% of those who say it is one of their top interests, expect Alabama to be victorious. But they are not more likely to want Alabama to win. 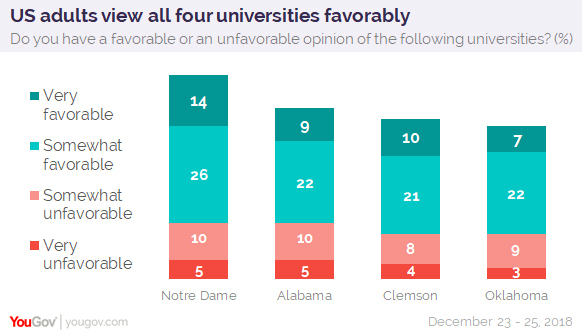 Three in ten choose Alabama, but nearly as many will be cheering for the University of Notre Dame. That appears to be mainly because as the only Roman Catholic institution among the four teams, it is the sentimental choice for American Catholics. 42% of Catholics will be rooting for the Irish, 27% for Alabama. Last year, support for the four final teams (Clemson, the University of Oklahoma, the University of Georgia, and Alabama) was pretty much evenly divided. Just about one in four of those interested in college football chose each team as their favorite. Fans expect Clemson and Alabama to wind up in the final game, making the championship game an all-South matchup once again. By more than two to one, they think Alabama will defeat Oklahoma in the Orange Bowl. 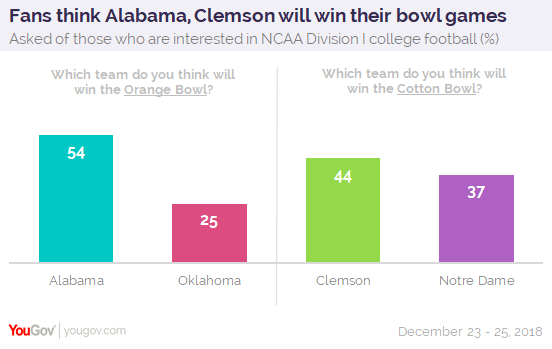 While a plurality believes Clemson will beat Notre Dame in the Cotton Bowl, fewer expect a Clemson win in the Cotton Bowl than see Alabama taking the Orange Bowl. More than a third believe Notre Dame will advance. That includes a majority of Catholic football fans. By 55% to 37%, they look to a Notre Dame victory. Interest in Division I college football is lower than interest in the National Football League. In a September Economist/YouGov Poll, 36% said they were at least somewhat interested in the NFL. Fewer, 26%, say that today about Division I. Most of those interested in college football say they may watch the playoffs, though just 32% of fans are definitely sure they will do so. The four universities are all seen favorably, but Notre Dame does better than the other three. Again, that’s due to the opinions of Catholics. Among Catholics, 52% have a favorable opinion of Notre Dame. Just 15% are unfavorable.